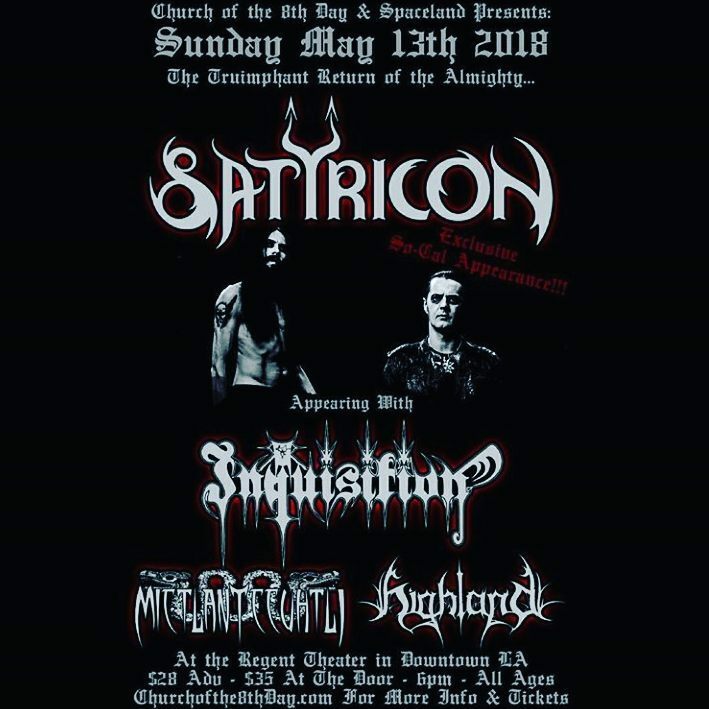 The debut show of what could be their last American tour; Black Metal legends Satyricon delivered an eagerly awaited performance in LA. This auspicious occasion was supported by the ranks of Highland, Mictlantecuhtli, and Goatwhore. 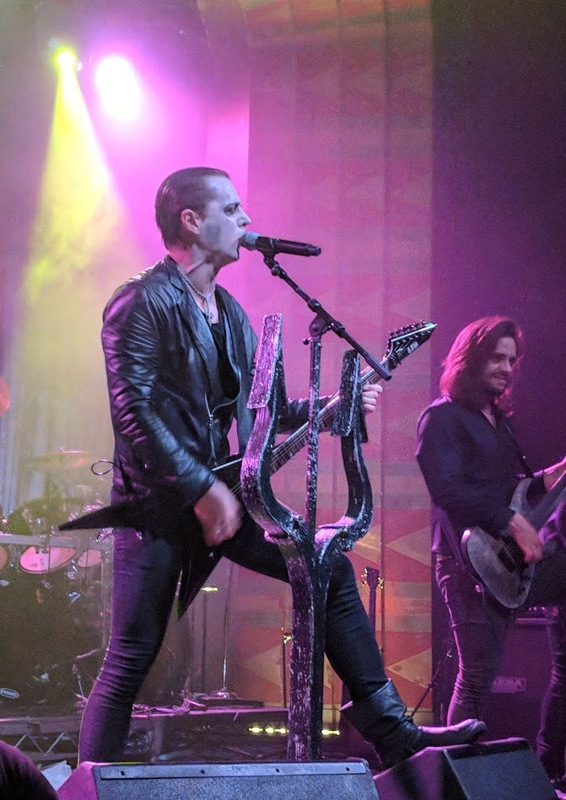 With nine years separated from the United States, the arrival of Satyricon upon our shores meant the first and perhaps the last opportunity for many fans to witness the band live. As Goatwhore exited the stage with what could have been considered a show-stealing performance start to finish, the crowd became aware of what was next in store for the night… Enticing the audience with nearly ten minutes of their iconic synths and orchestra samples in complete darkness, the band finally arrived with their opening track. Tracks like “Our World Rumbles Tonight” and “Black Crow On A Tombstone” set the tone for the first section of the show. The band performed each song with album precision. A whirlwind of headbanging took place as Satyr and Frost, supported by rest of their group, showcased their unique working dynamic. Satyr’s wraithlike vocals penetrated through the mix to guide the listener through each song, which was fortified by the abominable drumming of the iconic percussionist. The set relentlessly continued on, playing mostly contemporary material, establishing that the band has embarked on this tour with a focus on their current release. The title track from that album “Deep Calleth upon deep” was followed shortly later by “Blood Cracks Open The Ground”. The crowd reception seemed less favorable during these songs, especially the latter. Things woke back up for “The Wolfpack” from their 2002 album, Volcano. The riffs are dark and constant in motion, with the venue providing a huge live mix. Following after, my personal favorites off of their new album, the single “To Your Brethren in the Dark” and “Black Wings and Withering Gloom”. Out of all of their new material, these songs are both personally highlighted for having familiar elements that veteran listeners would enjoy. Each setting their own genuine and melancholy atmospheres, one song led into another to prepare for what was next. Satyr dawned his guitar to signify the next phase of the show.  For what could be considered the apex of the performance, the classic “To walk this path of sorrow” from Dark Medieval Times began a sojourn to a time of when Black Metal was young. The atmosphere felt like a time capsule, as many fans were hearing this audible relic being presented by the ones who created it. The song concluded, with Satyr summoning the next offerings from “Nemesis Divina”. The instrumental track “Transcendental Requiem of Slaves”, who was also joined by Satyr on guitar, set the tone for the flagship Satyricon track, “Mother North”. The song detonated the crowd’s excitement. Though, being started without their typical choir/lead live performance, the classic tore through the night. The crowd answered back with a raw orchestration of chanting and headbanging. Satyricon exits the stage as the crowd cheers. Moments pass, as the band makes for the final stage of this performance. Again wielding his guitar, Satyr and the rest of the band rejoined the stage, with Satyr beginning the melody to “The Pentagram Burns”. 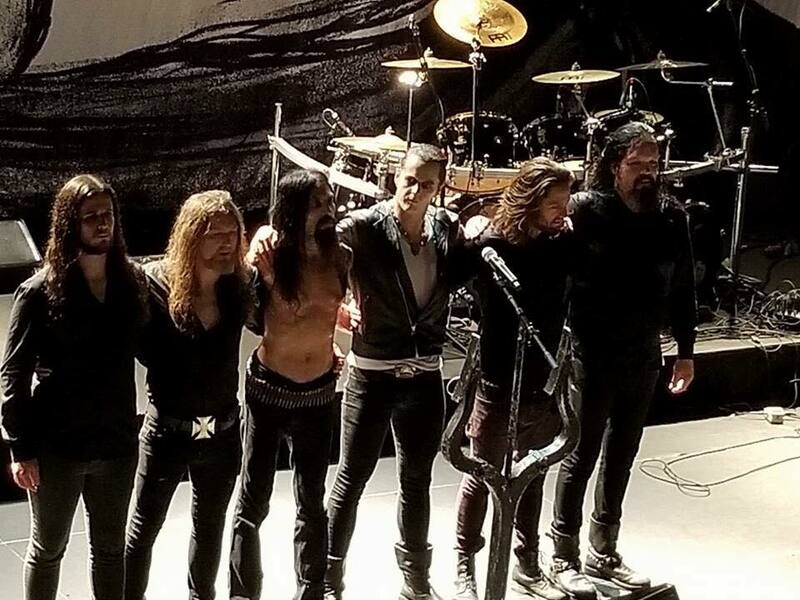 The band rips through three encore songs, periodically taking moments to share some words and banter with the crowd, and ending on a somewhat anti-climatic note with KING. The band was met with a well-deserved wave of celebrated applause as they took their bows and exited the stage. 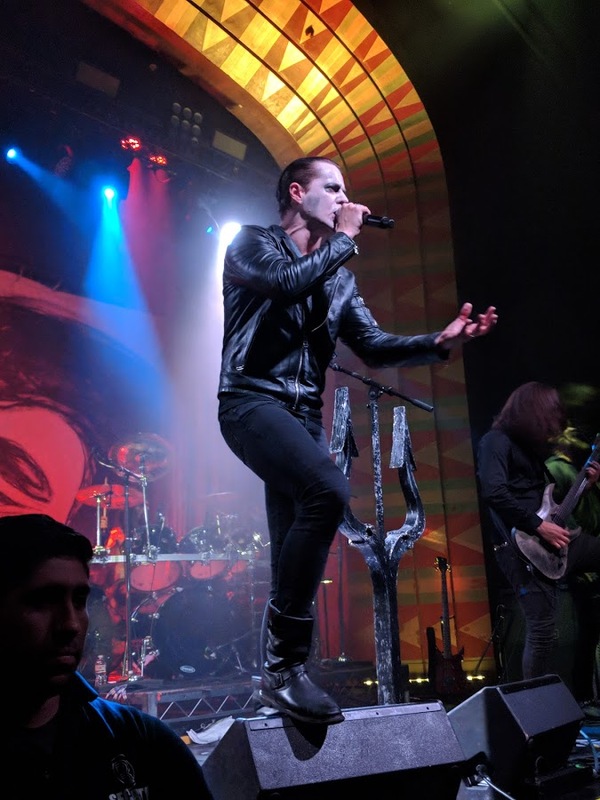 Regardless of the setlist being comprised mostly of contemporary material, the elements that make Satyricon who they are in the Black Metal world were absolutely present on this nostalgic and grim occasion.